Create a new Android project with an empty activity. Open the manifests file and add the following permission to read the SD card. According to the Android Developer Guide android.permission.READ_EXTERNAL_STORAGE is a dangerous permission. Add a TextView and a Button to the activity_main.xml as shown below. The button calls an on-click listener function named list which is to be defined in the next step. As you can see, the TextView is wrapped in a ScrollView to handle a large number of files. * Recursively list files from a given directory. The listFiles receives a directory and recursively list files in that directory. If the newly found File is a directory, it's sub-files are listed recursively. If it is an actual file, the absolute path of that file is appended to the txtFiles TextView. The list function checks if the Android version is 6.0 or later and if so, it checks if the READ_EXTERNAL_STORAGE permission is granted. If it is already granted, this function simply calls the listExternalStorage function. If not, it requests the permission. The onRequestPermissionsResult function will be called when the user has responded to the permission request. In that method, we check if the user has granted the permission and call the listExternalStorage function if the permission is granted. As you can see, listing files from SD card is implemented in Step 4 but it requires the runtime permission check after Android 6. Running this code will show you the application with a button to list files. However, it is not recommended to traverse the SD card in the main thread because it may take a long time if the SD card contains a large number of files. 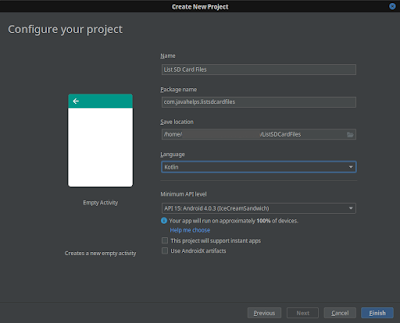 Add the rxjava dependency to the build.gradle (Module: app). After saving the changes, synchronize the project to download the dependencies. Notice that there is a disposable instance variable which is used to dispose the RxJava resources in the onPause method and in the onComplete (the third block in the subscribe method call) lambda expression. Now there is a FileLister publisher which receives the parent directory to traverse and publish the files to the subscriber. Once the traversal is completed (after the recursive method call), the publisher calls the onComplete method to let the subscriber know that the process is completed. The listExternalStorage function executes the publisher in a separate thread and appends the result to TextView in the main thread. Though we can list all the files from the external storage, it is not recommended to do so unless otherwise there is a valid reason behind it. You can find the source code of this project at the GitHub repository.